RATES: 2014 $40. 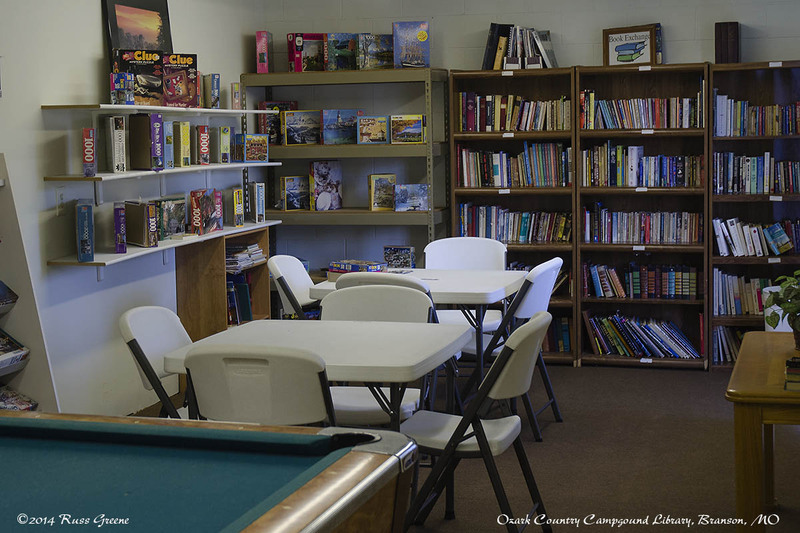 Note: Ozark Country Campground is a member of Passport America which provides discounts of 50%. (See my Passport America report here.) 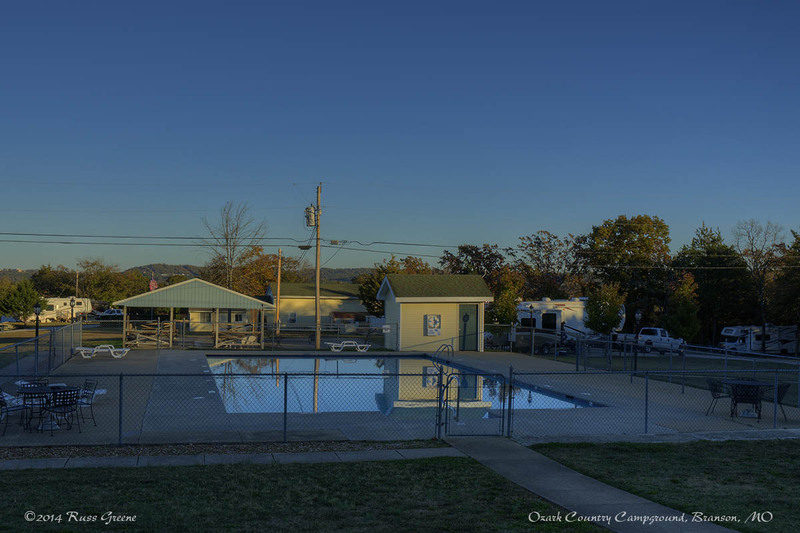 Unlike most Passport America campgrounds which restrict campers to one or two nights at the discounted rate, Ozark Country Campground has no such restrictions. 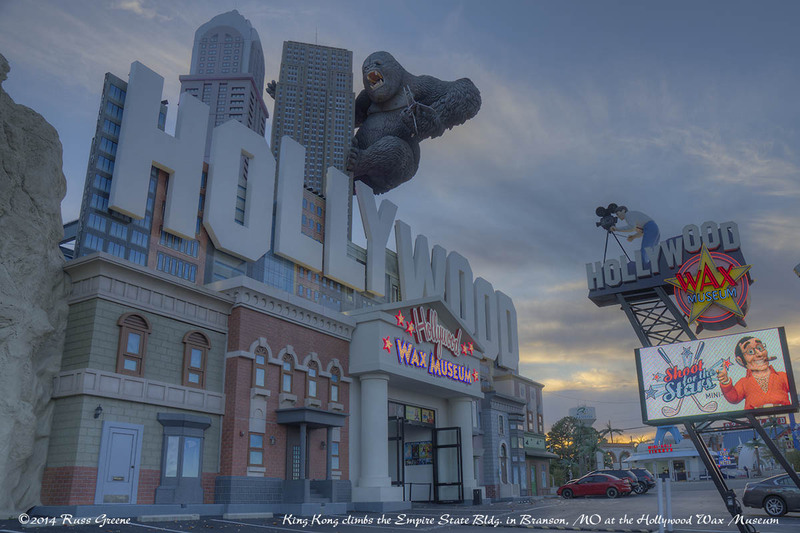 Passport America members can stay al long as they like, any time of year for $20 per night. PETS: There is no mention of a leash rule in the literature but the owner will ask you to leash your pet. 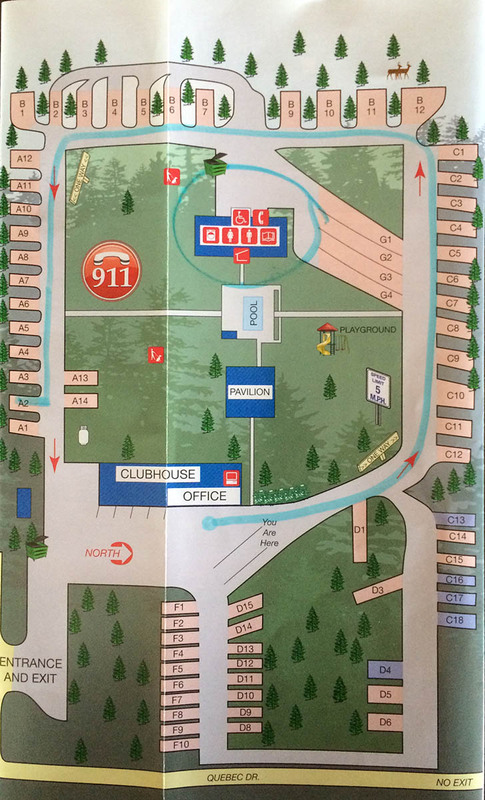 Here’s a photo of the page from the Ozark Country Campground brochure that shows the layout of the place. BUGS: Not when I was there in early Nov.
Branson, located in southwestern Missouri near the Arkansas border. If you don’t already know, it’s an entertainment Mecca with a great many venues, and dozens and dozens of shows. 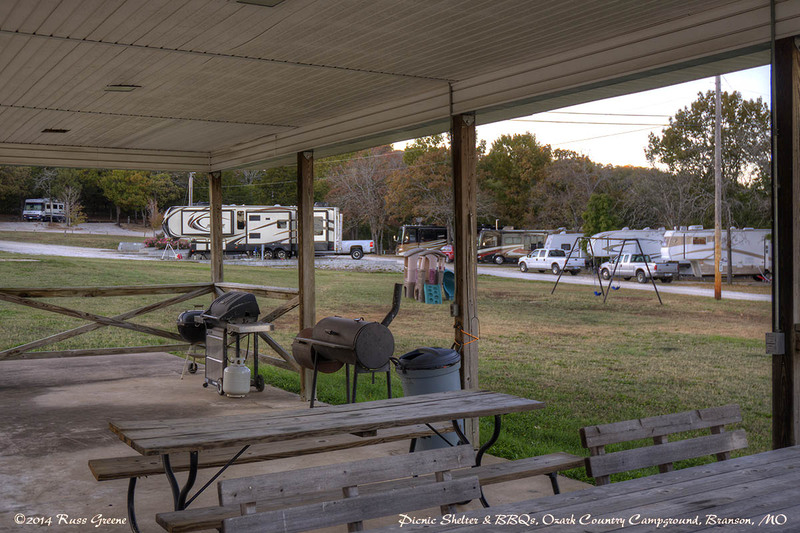 This campground is a few miles from the main drag in Branson where most of the entertainment venues are located. 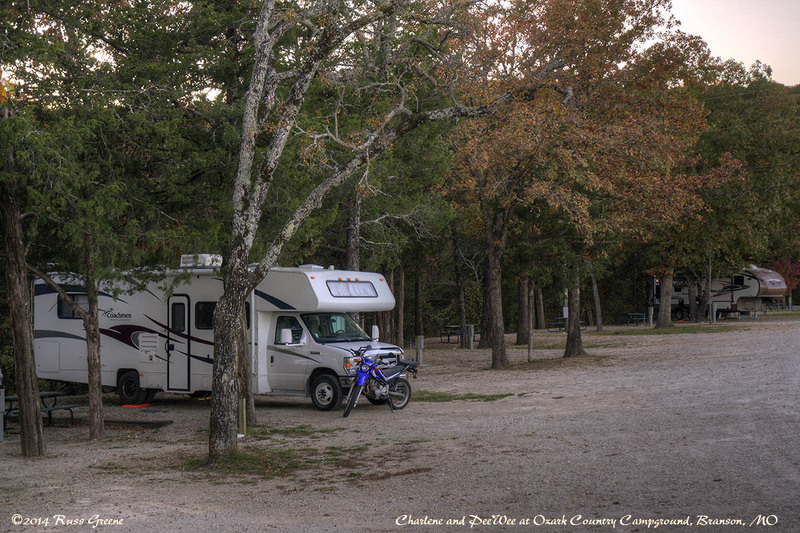 In my estimation it represents an unusually good value for Passport America holders (my blog report on Passport America is here) and is otherwise competitive with other RV parks in the Branson area. The campground web page has many details about the place that I needn’t duplicate here. I will say, however, that the playground is minimalist and there wasn’t much in the office store by way of RV supplies or food so you’ll probably want or need to look elsewhere for things you, well, may want or need. In addition to my photos on this page there are more on the campground’s site. Campground personnel were personable and helpful. “Branson is a city in Stone and Taney Counties in the U.S. state of Missouri. Branson is in the Ozark Mountains. The community was named after Reuben Branson, postmaster and operator of a general store in the area in the 1880s. The population was 10,520 at the 2010 census. The Branson Micropolitan Statistical Area embraces Stone and Taney counties. Some of these venues are home to multiple shows (see photo). Some attempt to capitalize on famous names that have come and gone, Elvis Presley for example. This isn’t to say you can’t find an excellent Elvis impersonator in town, but I think some venues have adopted names of or similar to personalities in what may be a self-serving manner. One show I took in was a tribute to the band Journey. The venue was the Tribute Theater which is home to other tribute bands and shows. I’m going to see the Eagles Tribute tonight. The musicians who performed the Journey show did an excellent job. It might be hard to tell their music from the originals. I also went to hear an a cappella group called the Cat’s Pajamas at the Music City Centre Theater because I like a cappella (voice without musical instrument accompaniment) and because the show was well reviewed on TripAdvisor. This group is overflowing with energy. They toss in some comedy along with their well performed harmonies of songs we all know and love. Approaching the holiday season as we were when I was there, the second act included a number of novel and well done Christmas songs. I’ve always loved much of the popular Christmas music even though I’m not a believer. 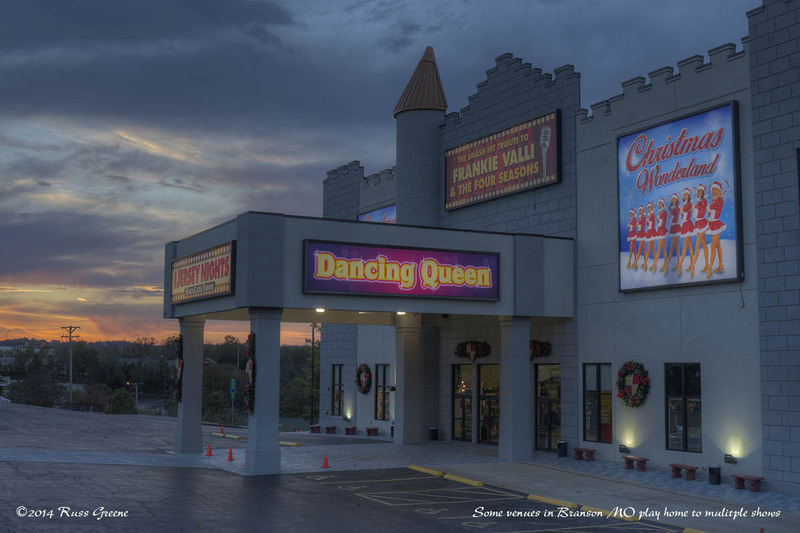 Hot Tip: If you find yourself in Branson wanting to take in some entertainment try Terry’s Tickets, 417-331-2582. (Prices on line may not be current for all shows and additional discounts are discounted if you book before 1 PM, so it’s best to call.) There are all sorts of billboards around town promoting 2 for 1, or half-off tickets from other ticket providers. If you enjoy sitting through time-share presentations and high pressure sales people trying to get you to buy a time-share, then these would be just the ticket for you. If you’d prefer to get tickets that are discounted a few bucks and to have them delivered to wherever you are staying o have them waiting will-call then call Terry. He answered the phone personally the three times I called, and people at the box offices all seem to know him. Small town. I opted to pick up my tickets will-call at the theaters rather than have to pick them up from the campground office during their business hours. The former was more convenient and easier for both me and Terry. Ask at the office wherever you stay to see if they have a list of shows and ticket prices from Terry’s Tickets.